be an easy to use resource down the line. So click the link below to see it uses and bookmark the blog for weekly installments. I will be posting an herb of the week every Tuesday. I find it is easy to remember things like this when you get them in small doses. 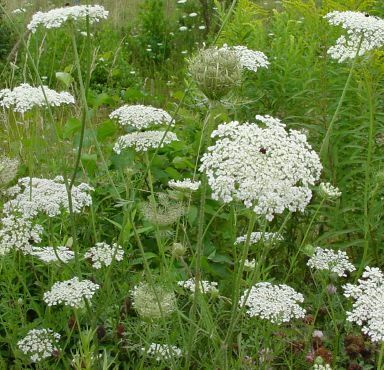 Queen Anne's Lace can grow 4 feet tall. The leaves are 2 to 8 inches long and fern-like. We all know the flowers, which are tiny and white, blooming in lacy, flat-topped clusters. Each flower has a dark, purplish center.